FIGHTING SUN progeny have been hotly sought after with his first two crops impressing buyers. He's a young stallion by the ill-fated Northern Meteor and his 2yo's are starting to make their mark. This filly is out of the 5-time city winning mare Web of Love who has had one foal to race for a winner! She is VOBIS and VOBIS SIRES ELIGIBLE! 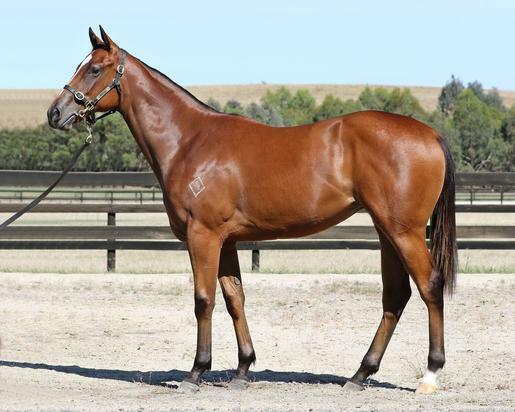 Fighting Sun x Web of Love Filly (TURN UP SOUND FOR AUDIO UPDATE) from Dalziel Racing on Vimeo. Lot 639 Inglis Premier - Fighting Sun x Web of Love Phillip Stokes - FINAL PDS from Dalziel Racing on Vimeo. Eat My Trust (g. by Trusting). 4 wins from 1200m to 1600m, A$114,000, in 2016-17, BRC CMG Plaster H., 2d BRC Amgrow P.
Evil Cry (Street Cry). 2 wins at 1200m, A$101,185, in 2017-18, 2d MRC Schweppes 2YO H., 3d VRC Taj Rossi Series Final H., L, Eugene Gorman 2YO H., 4th SAJC Morphettville Guineas, L.
Web of Love. 5 wins. See above. Red Bowers. 9 wins at 1000m, 1200m, A$149,550, to 2017-18, 2d BRC Ascend Sales H., Ipswich TC Civil Pro H.
Equal Luck. Winner at 900m, 2d Ipswich TC Sirromet H.
Don't We Love It. 8 wins-1 at 2-from 1000m to 1600m, A$166,635, to 2018-19, MRC Buyaracehorse.com.au H., TTC Neil Buckby Landrover H., Devonport RC Birdcage Tavern H., 2d Tasmanian Farmer H., Devonport RC Bird Cage Tavern & Functions H., Birdcage Tavern & Function Centre H., Tasracing.com.au H., 3d BRC Billy J Boutique H., Devonport Racing Club H.
Golfing. 8 wins to 1200m, A$124,825, to 2017-18, 2d BRC Giddy Up Club H., MRC (Mornington) Musk Creek Farm P., 3d BRC Doreen Bird H.
ABBI'S CHOICE (Slewacide). 19 wins to 6½f, US$379,181, Remington Park Autumn Classic H., L, Fair Meadows Tulsa Sprint S., L.